Are you looking for a perfect gift? 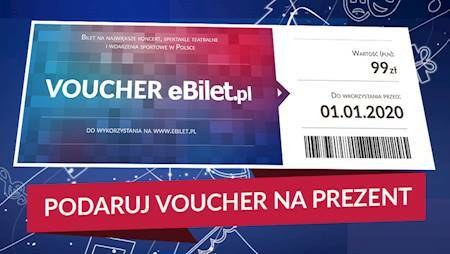 Get eBilet Vouchers! Companies use a lot of motivational tools to reward their best employees. Surprise your staff with our eBilet gift card! eBilet Voucher is a perfect way to thank your employees, as well as motivate them. It's a great alternative to just giving them company gadgets. The eBilet Voucher is also a perfect gift for your key business clients. It will show them how much you value their business. When you give somebody an eBilet gift card, they can choose the event themselves from our vast offer. They will decide what they want to see, when and where - you can be sure they'll happy with the eBilet Voucher! Improve your brand's image, and become more popular - get the eBilet Voucher right now! You can get the gift cards online, and we will send you a great looking printable gift card to your e-mail address. We can also send you the printed gift cards through mail or courier. We can personalize them to your liking, adding your company's logo or changing the layout upon request.